4x Universal Antivibration Pads. 4x Adhesive Pads (not required). MONEY SAVER: The pad may help reduce maintenance costs. The center of the anti vibration pads contains a pre-drilled 5/8" hole for easy anchoring or securing. 4 Anti Vibration Pads. Utility Knives. Compressor Parts. Created out of Recycled Aircraft Rubber. DESIGNED FOR SEVERE VIBRATION APPLICATIONS. applications are endless. Including, but not limited to, using alternative products. SUPER DUTY PADS ARE GOOD FOR INDOOR/OUTDOOR USE. thats 960 lbs per individual pad. EVA is not affected by oils or chemicals that can break down cork and is much more effective at vibration dampening than solid rubber. Choose EVA to get the best of both worlds! Note: The vibration pads may have rubber odor initially that will go away eventually. We have pre-cut these pads to fit 2x2x1 use. Including, but not limited to, using alternative products. We would be more than happy to correct any issue. WE WILL correct any potential problem. SUPER DUTY PADS ARE GOOD FOR INDOOR/OUTDOOR USE. The high quality rubber and eva construction makes for an affordable and long lasting anti-vibration pad. • EVA - Used as the core vibration dampening material. • Rubber - Used as the anti-skid surface on the top and bottom of the pad. Washer shock pad slip mats refrigerator anti-vibration pad 4 pcs / set;. Anti vibration: Resilience and high tensile strength, high toughness, with a good shock, non slip, buffer performance;. 4 Anti-Vibration Pad. Reduce maintenance costs for use on washers and dryers. Reduce noise. Easy To Install. Evelots Anti Vibration Pads-Washer/Dryer-Anti Walk-No Noise-Universal Size-Set/8. DESIGNED FOR SEVERE VIBRATION APPLICATIONS. applications are endless. Including, but not limited to, using alternative products. 4 SUPER HEAVY DUTY ANTI-VIBRATION PAD 6"x 6" x 7/8". THESE BLUE COMPOSITE PADS ARE 7/8" THICK. Washer shock pad slip mats refrigerator anti-vibration pad. Shock absorbent reducing noise and vibration. 4pcsAnti-Vibration Noise Reducing Shock Absorbent Washing Machine Pads. Item type: pad. Suitable for: washing machine. RIBBED RUBBER OUTSIDE WITH CORK CENTER. Including, but not limited to, using alternative products. We would be more than happy to correct any issue. WE WILL correct any potential problem. RUBBER/CORK PADS ARE GOOD FOR INDOOR USE ONLY. Reduce maintenance costs for use on washers and dryers. MONEY SAVER: The pad may help reduce maintenance costs. 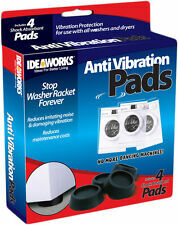 UNIVERSAL USE: The pads can be used for all washers and dryers. EASY INSTALLATION: Simply slide the pads under each corner for maximum performance. THESE PADS ARE 3/8" THICK WITH RIBS ON TOP AND BOTTOM. These are high quality anti vibration pads that feature corrugated anti-skid top and bottom rubber surfaces with a cork center. These anti vibration pads can be used for a variety of applications, such as: air compressors, HVAC, refrigeration, and more! The high quality rubber and eva construction makes for an affordable and long lasting anti-vibration pad. • EVA - Used as the core vibration dampening material. ��� Rubber - Used as the anti-skid surface on the top and bottom of the pad. THESE PADS ARE A RIBBED DESIGN WITH A CORK CENTER. 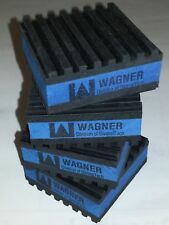 8ANTI VIBRATION PADS 4"x4"x7/8". Including, but not limited to, using alternative products. We would be more than happy to correct any issue. WE WILL correct any potential problem. The anti shock, anti slip and anti-vibration pads are a great kitchen accessory to support your washing machine or dryer and stop them from damaging your kitchen floor. 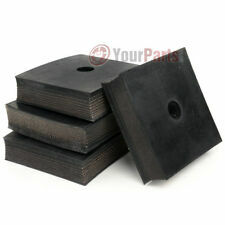 4 x Anti - Vibration Washing Machine Feet Pads. 4 pack of anti vibration pads isolation pad dampener ALL RUBBER 2"x2"x3/4"
Including, but not limited to, using alternative products. We would be more than happy to correct any issue. WE WILL correct any potential problem. SUPER DUTY PADS ARE GOOD FOR INDOOR/OUTDOOR USE. All rubber construction. 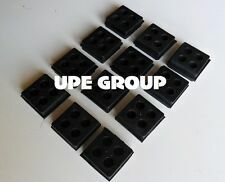 Anti Vibration Pad All Rubber Isolation Dampener Industrial Heavy Duty 4x4x3/4"
Blow Guns & Tire Inflators. This is a high quality anti vibration pad that features durable rubber construction with anti skid suction. This anti vibration pad can be used for a variety of applications, such as: air compressors, HVAC, refrigeration, and more!